A history of pure-bred cattle in the U.S. Kerry, Dexter and Milking Devons will the the origional focus of the Blog. The Single Gloucester cheese is a farmhouse cheese traditionally made in the Gloucester region of the UK. This cheese is often associated with the Gloucester cow, a traditional Celtic breed from that region. In the US, there is a lineback color variation with that name, but it is not the same animal at all. To use similar milk, I would suggest Ayrshire, Kerry, or Shorthorn. You can, however use any breed, just keep the fat content in mind. It traditionally was made with skimmed evenings milk and whole meal (whole milk, no fat removed) morning milk. It was made in the spring and early summer. The acidity of this cheese is lower and the curd ripens quicker than some other cheddar varieties. Traditional wheels are 38cm diameter x 7.6 cm height and weigh 6.8-8 kg. The curd is white to yellow depending on the time of year and the texture is open, with a soft body. Like Dunlop, it is often eaten younger and has a mild cheddar profile. Aim for 2.8-3.2% fat. No heat treatment it needed for this cheese. No color added to this cheese. Warm milk to 80*F. Add culture (0.125-.5%). Ripen 45-75 minutes (depending on amount of culture added). Bring milk up to 86*F. Add rennet as per directions for rennet for this quantity of milk (note, I am vague here on qty so that you can adjust, ask to learn how to do that) to cut curd in 45-50 minutes. Cut to size of maize (corn). This is a larger curd than most cheddar, hence the more acidic paste. (3-6cm). Let sit until you just see the whey on top of curd. Stir slowly at first. After the curd has started to develop 'skin,' start to scald. This takes 10-12 minutes depending on how fast it acidifies. Scald to 98*F. Note, this is cooler than most cheddars, but this is also a lower fat milk. Stir on and off until firm. (10-30 minutes generally. What firm means will take time and someone showing you...). Pitch curd until acidity of 0.13-0.14%. Break curds into 10cm squares. Let drain and break again. Keep doing this until the size of walnuts. They will be ready to salt when the curds are dry and firm. Add 1.7% salt in last three breaks. Stir to ensure even salting. Put into warm hoops that have been warmed. Make sure cloth is warm as well. Press small pieces into the corners. A coarse cloth is best for this press. Press at 250kg per cheese for one day. Turn and redress with finer cloth. Repress at 750kg per cheese. Turn and repress for another 12-hours or to next day. Cheese is dressed with butter or lard for 1-3 months. I will post a video of how to mind rinds later. Clean off outer mold before eating (you can cloth bind as well). For double Gloucester, you use two whole meal additions of milk (whole milk am and pm). It is as it comes out of the cow. You will cook to a higher temp (2-4*F generally, with higher fat milk getting higher temperature cook). Curd size can also be smaller. If a smaller qty of milk, you can gather curd in a cloth and press it lightly to keep curd warm and to get the same texturing effect that you would with larger quantities of milk. This makes sense to me. If you have any questions, I will be glad to clarify them!! Good luck and post any photos of attempts! I get a request for a recipe for Clotted Cream a lot. As this is a traditional dairy product of the south west of England (Cornwall and Devon) and the American Milking Devon is the purest example of what would have been in the area Once Upon a Time, I thought I'd include it in a post here. Start with the freshest Devon raw milk (raw is important here or this does not work). Pour into a pan about 6" deep. Put into a cool place until the cream rises to the top. This may take 10-20 hours. Place pan in a water bath on stove. Gradually increase the temperature of the milk to about 175 degrees or so. The temperature is not as important as the ring around the edge and the bubbles or wrinkle that will show on the surface of the milk. This may take 45 minutes to an hour. Cool immediately. Cream will thicken as it cools. Remove the cream with a slotted spoon. Enjoy with Cornish Splits or scones and a wild berry jam. The old pans held 6-7 (American) quarts of milk or cream. They were 15" in diameter at the top and 11" diameter at the bottom and 7" high. Some people skim off the cream from the milk setting overnight and collect in a pan (or pudding basin of this dimention) and continue with the recipe. It will taste cooked or carmelized (some say burnt). The best thing there is! 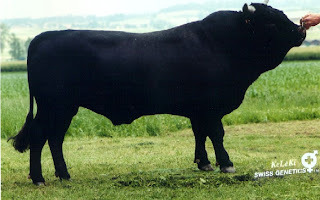 Here is a cut and paste of a Herens bull from Switzerland. This is also a genetic cousin of the Kerry cow. I guess you can say the genetic root of the "celtic cow" may have started with the genetic root of the Celtic people? From the hand holding the bull, I'd think they aren't overly large animals. I grabbed this late at night once a while back. Thought I'd ad it to the mix for those researching the genetic make up of the celtic cattle breeds. It would also be nice to see if someone can find more about the two migrations of people from Ireland and Kernowek (Cornwall) to Brittany and see if there is anything more about the influence of the Britonne and Irish breeds. In an old book I have West Country Stories by A.L. Rowse he notes (pg 103) "The deer-parks were a very important part in the economy of the Duchy. When it was constituted there were seven: Kerrybullock (now Stokeclimsland), with 150 deer....With movement for enclosure that grew strong in the sixteenth century, Henry VIII decided to dispark the Duchy parks and turn them more profitably into pasture. It is the site of Kerrybullock Park, in the parish of Stokeclimsland, that the large Duchy farm now occupies..."
Laurence Gilley has scanned books on the M. Devon breed for the Milking Devon web site. You can run through some of them. One notes that the Cornish version of the M. Devon is not so pure and has influences of other breeds. I'd have to go back and see which one it was. Not very kind about the Cornish influence, but British history has never been overly kind toward any Celtic people, let it be Ireland or Cornwall. Again, some phtots from Patti Adams regarding the comparason of phenotypes of Dexter, Kerry, Alderney and Breton cattle. It is about time I put some of Patti Adam's research on this blog. She is the one to draw my attention to North Oaks Farm and James J. Hill. Below are some of the links to information about him. He never registered any of his Kerry cattle with the American Association. Charles Plumb did note MN and MO breeders of notable Kerry cattle and they do not show up in the herd book or bulletins. Mr. Hill also had a number of other breeds of cattle. There is also a book on Google Books called "Lessons of My Farm" from 1862. 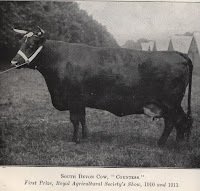 She sent me scans of pages of interest that suggested a link to the Alderney Cattle in the development of Irish breeds. It is in word and I will try to convert to a format the blog likes. That or I will go back and find it and provide to the link. This is an excellent book. This is one of the ones people cut pictures out of an sold for a fortune. Jerks! Also, see Lawrence's CafePress store for a copy of m.Devon herdbooks. American Devon Record, Vol 1, 1881. Hello everyone. Yes, a while since I posted again. Winter. That cruel cold word brings more chores in the beginning. Just starting to get into the swing of winter chores. I will actually have more time to post after this holiday stuff. 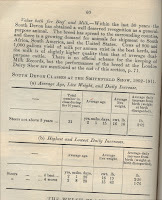 I have prepared a list of Devon breeders in New York State from the registrations recorded in volumes one and two of the American Devon Record and arranged them by county. There are 198 breeders in total. There are 144 breeders in volume I. There are 88 breeders in volume II. Although volume I is dated 1881, it covers quite a few years before its publication date. I will try to get up to date on other postings of historical stuff over the next couple of days. We shall see. Whitelaw Reid - Purchase, NY ~Tribune Editor~ Had a neice nammed Ella? F.E. Stevens - Glens Falls, NY ~I've included a lot on him. Still looking for his cattle. Did grab Dutch Belted herdbooks from UMASS library. Copied his information. Would like photo and info on his Kerry Cattle. Herbert Livingston Satterlee - NY, NY ~lawyer. wife Louis. His dob c. 1863 in NYC. Lived on E. 36th Street in Manhattan. Orin G. Predmore - Valois, NY ~Ovid, Seneca County. 1930 census lived on Rock River Road. Farmer. #farm schedule 83. 1920 census Hector township. Henry Ambler - Chatham, NY ~not in herd book. Was noted as having one of the largest NY herds. Also had Jersey cattle. House is currently a restaraunt. Also noted is a CA breeder F.J. Rodgers - San Francisco, CA >1910. He bought a lot of cattle as noted in the transfers of cattle. Anyone have info about the Elmendorf sale of Kerry Cattle? Rumor has it the Peerless herd may have some of them. Also Charles Plumb noted a number of unregistered herds in MN and MO. Anyone remember any old ag publications from those regions that may have noted herds or know of "Irish Districts" in those states where they may have been. Neither Ohio State nor UMASS Amherst has information on their herds. I have more on Ohio State only because I have the herdbook and bulletin. The only possible note about the UMASS cows is the mention of Black Cattle in an old TB/Brucellosis testing paper found by Special Archives there.